Native to northern regions of Europe, Asia and America. As a herb it has great medicinal value and is used against contagious diseases such as cholera, typhoid fever and the plague in Tibet and in Europe. An evergreen perennial shrub that may reach up to 5-meter(15 ft.)high with bluish-green narrow needle like leaves. It has an irregular stem and the leaves are terminated by a sharp thorn. Inconspicuous male and female flowers on separate plants. The berries are round and blue-violet in color. Juniper oil can be extracted from the berries, as well as the needles and wood. It has a fresh, clear but slightly woody aroma and is a pale oil with a watery viscosity. Chemical constituents: Juniper berry oil has various chemical compounds that include Borneol, Terpinenol, Myrcene, Monoterpenes, pinene, sabinene, limonene, cymene, thujene and camphene. Extraction: It is extracted by steam distillation of berries. 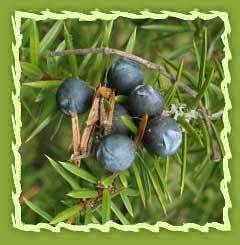 Juniper acts on the urinary, respiratory, nervous and digestive systems as an antiseptic. It works like a Supportive, restoring and a great nerve tonic. 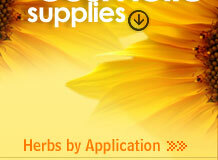 Cleans the atmosphere of the surroundings and also proves to be good oil for meditation. It has great effect in the brain as supportive, restoring and a great nervine tonic. It cleans the atmosphere of the surroundings. Good oil for meditation. Popular oil in weightloss and detox blends, because it is diuretic, and considered purifying and clearing. It effects on the body include the possible uses against cellulitis, gout, hemorrhoids, obesity, rheumatism and toxin build-up. It is primarily used in the treatment of urinary tract infections such as cystitis and urethritis. Juniper is very potent as a diuretic and may cause the urine to smell like violets. It helps clear acid wastes from the body, promoting the excretion of uric acid at the kidney. Juniper tea or tincture is warming to the digestive tract and can help stimulate weak digestion. Both the tea and tincture can be used for upset stomachs and to relieve flatulence. It may also be used for relief of menstrual cramps, chronic skin conditions like eczema and psoriasis.It is popular oil in weight loss and detox blends because it is diuretic and considered purifying and clearing. Juniper berry is very popular ingredient in masculine, outdoor-type perfumes and after shaves due to its spiced woody smell that is ideal for use in aftershave and other men's products. Juniperberry is widely used as fragrance oil throughout European countries and in some South Eastern parts.Fragrance oils are skin safe so they can be used in skincare, body care, beeswax candles and all other general cosmetics, also in diffusers, pot potpourri, soaps both cold process and melt & pour. Fragrance oils are synthetically produced to have the natural essence fragrance of flowers, spices, scents of many different things including foods and herbs. The fragrance oils can be used as atomizers, bathes, body sprays, sprizters, candles, soaps, incense, room sprays, potpourri and so much more substances.